Middle-Earth jokes aside, this is an actual place, of course. 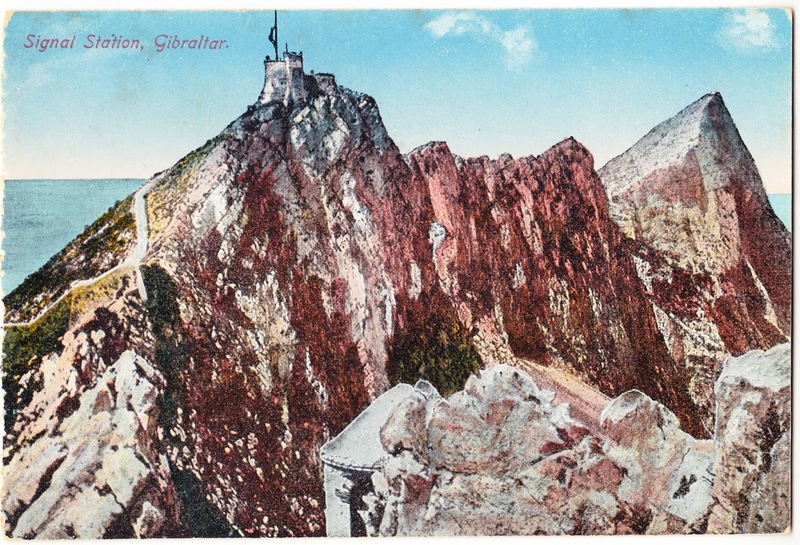 The undated, unused postcard, published by Benzaquen & Co., shows a signal station high atop the Rock of Gibraltar. Because of its strategic signficance, Gibraltar is "probably the most fought over and most densely fortified place in Europe, and probably, therefore, in the world," according to Field Marshal Sir John Lyon Chapple, who served in the British Army from 1954 to 1992 and was Governor of Gibraltar from 1993 to 1995. Given this military significance, there have been fortifications and artillery installed all over the Rock over the centuries, often with those installations constructed upon the bones of previous structures. They have names such as the Bombproof Barracks, Defensible Barracks, Jumper's Bastion, King's Bastion, Breakneck Battery, Detached Mole Battery, Devil's Gap Battery, Devil's Tongue Battery, Oil Tanks Battery, Signal Hill Battery (an older version of which might be shown on this postcard), Montagu Curtain, Ragged Staff Gates, Admiralty Tunnel, Stanley's Clock Tower, Tower of Homage, and West Place of Arms. 1. I'm still not advocating e-books.